Images of an expanding gas and ash plume from Colima, drawn every 10 seconds after an explosion in the summit crater. Images based on photos captured using an infra-red camera, created by Erica Webb. Colima, or more properly Volcán de Colima, or Volcán de Fuego, is the active vent of a large twin-peaked volcanic complex in western Mexico. Colima has been in an elevated state of activity – with pulses of lava dome growth within the summit crater, occasional lava flows spilling out of the summit crater, and frequent explosions, since the late 1990’s. Colima is a stratovolcano, that lies in an area called the ‘Trans-Mexican Volcanic Belt‘ by geologists. It owes its origins to the ongoing subduction of the small Rivera tectonic plate beneath the North American plate, which is just one of a number of plate boundaries that flank the Pacific Ocean and lead to the so-called Ring of Fire. Last known eruption: Colima remains active, erupting throughout 2013 and 2014 but with more violent explosions in 2015, resulting in the evacuation of some of the population closest to the volcano. 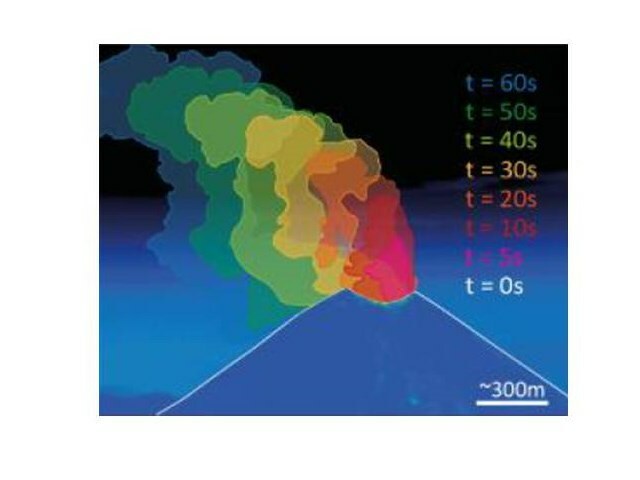 Explosivity (Volcanic Explosivity Index) – 5. Colima has experienced some major explosive eruptions in the past – with an explosion rated at VEI 5 in January 1913. Height – 3850 m. Colima is major peak, but is overshadowed by its neighbour, the extinct Nevado de Colima, which rises to 4340 m.
Deadliness. 1. Like all large, restless volcanoes Colima poses a substantial threat to the region, but few eruptions of Colima during historical times have led to casualties. Wow factor – 73. This is a striking and photogenic volcano. Unpredictability – 37. Like many stratovolcanoes, eruptions can range in size from the very small to the relatively large. Since 1576, Colima has erupted at least 4o times, and this means that scientists have a fairly good general understanding of its typical patterns of behaviour. One of our Top Trumps team, with his colleagues, has recently published an open access paper which shows that some of this variation in recent explosive behaviour can be attributed to magma that ascends and degasses at different rates. Devastation Potential – 350. Colima remains a dangerous volcano, in a heavily populated region of Mexico, and for these reasons it was one of the original ‘Decade volcanoes‘ identified by volcanologists in the 1990’s as being in particular need of further study in order to reduce the impacts from future natural disasters. The Colima Volcano Database, hosted by UNAM, has links to a lot of recent information on Colima and its activity. There are also some great pieces of footage of Colima in eruption, including a wonderful timelapse video by Osiris Ocampo, and a great You Tube video of a flight over the summit by STREVA researcher Jon Stone. This helped me with one of my homework! Thanks!